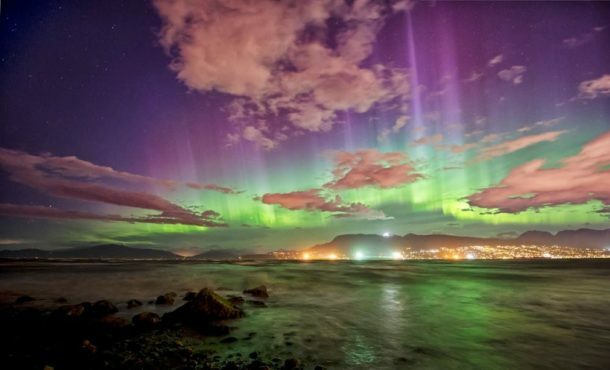 All around the world are obsessed with breathtaking colors of Northern lights. Luckily Canada is one of the best places in the world to enjoy Northern lights. The British Columbia, Northwest Territories, Alberta, New Brunswick, Nova Scotia and Ontario are some of the best places in Canada to watch Northern lights. The brilliant colors of Northern lights occurs when a stream of highly charged electrons from Sun collide with the air particles in the sky. This brilliant color show in the sky occurs 100-130 km above sea level. Even though Northern lights present year around the event only becomes clear to us when the sky is fairly dark. So winter is the best time to enjoy Northern lights. The resulting color of Northern lights depends upon the type of gas with charged electrons collide and the attitude. The reflection of green-red colors occurs when the electrons are interact with oxygen atoms. In case of nitrogen atoms you can see the reflection of blue, purple or violet colors in the sky. The Northern lights will last for a few minutes to a couple of hours.